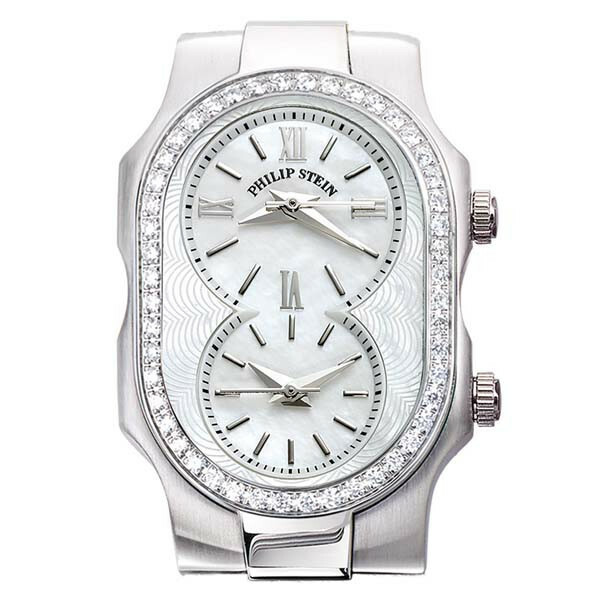 Put a little bling on your wrist whenever you wear this fabulous Signature collection watch from Philip Stein. The watch is crafted in stainless steel with a gorgeous diamond bezel. White Mother-of-Pearl highlights the dual time zone dial with Roman numerals, and a white, wavy surface surrounds the dial with an artistic touch. The ability to change the watch strap with any 18mm piece is a great way for you to change your look to something different. Philip Stein created Natural Frequency Technology, which is embedded into the watch's case, to enhance your health and well being while wearing your watch, so enjoy this spectacular Philip Stein watch for mind, body, and wardrobe! Watch straps are sold separately, and JR Dunn has a 10-day satisfaction guarantee for all Philip Stein products.